Does Intellectual Property Belong To the Company or the Employee? Who owns promising ideas for new products? It’s not always so clear. Sean Mack, an attorney with experience in intellectual property issues, says many executives who have developed innovative products, either on their own or with a new company, may find they are facing legal action claiming they stole the idea from an ex-employer. If a court rules the executive took something that belonged to an ex-employer, there will be expensive ramifications, Mack warns. They may have to pay the employer’s lost profits. They may even have to hand over the opportunity and its profits to the ex-employer. Mack says that one of the top issues before developing a new product is whether the executive signed either an employment agreement or a non-competition agreement. These may keep the former executive from pursuing such an opportunity. If there is no such agreement, a company still may try to claim it owns the opportunity. If a court case is involved, the former employer will likely try to raise the issue “whether the new business is within…[the] company’s ‘line of business’ or whether the venture would bring [the executive] into competition with [the]…company, or whether [the]…company has an ‘interest or expectancy’ in that type of opportunity,” Mack adds. 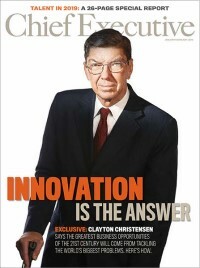 For more about who owns intellectual property, as reported in Chief Executive magazine, please click here.